Angel said, "Let's go out and paint pictures in the snow!" He said, "Your purple hair dye!" I was okay with painting the snow, but I didn't think that my purple hair color was the best way to do it, even if I didn't particularly like that shade of purple. Together, we brainstormed ideas. My oil paints? No, they wouldn't mix with water. Watercolor paint? We didn't have any. Angel was back to the plan of using purple hair color when I vaguely remembering seeing something about people painting snow with food coloring. I had food coloring! We were outside in the time it took us to choose our color and mix up some food coloring in a spray bottle full of cold water. It felt a bit risque, almost like we were vandalizing our own yard with our messages. But the next day it snowed again and covered them up. They didn't last long, but it sure was fun! I don't think either of us are destined to be graffiti artists. 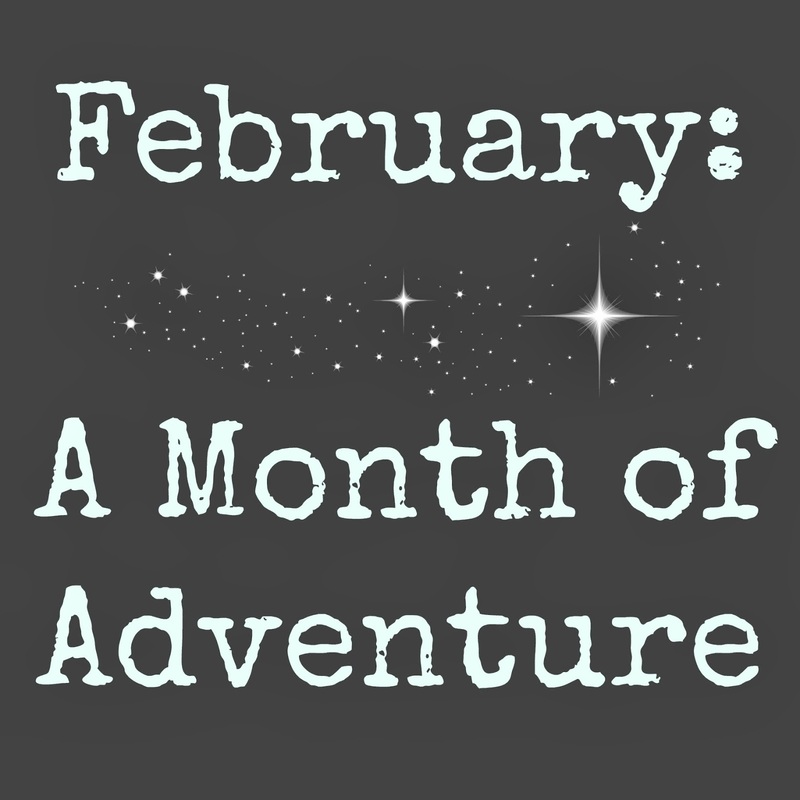 *Warning: If you decide on a month of adventure in February, realize that a rather large proportion of your adventure might end up involving snow. Because that's what you have to work with! haha...I love the Beware Cat one...and Morphine looks like he read the message! This is too funny! Love the way the cat looks like he is reading the message. a week ago we had snow, an ice storm, and an earthquake. today, it's 76. craziness!! hahaha the beware of cat one was hilarious. i am so over this snow! there's so much of it piled everywhere it makes backing out of the driveway hard because you can't see anything! LOL YES! That is such an awesome idea! I may have to suggest this to Iz once we're done getting dumped on with snow again. ha ha! I love the photo with the cat looking back on the sign. Oh this is fantastic! I wanna try! Too bad all our snow is melting. hahaha!! The cat one is hilarious!!! haha, the cat picture is the best. During our last snow, when we were out, I kept wanting to put some color in the snow as well. Food coloring and water in a squirt bottle would have worked. I didn't do it though. Haha! I love this idea! I want to vandalize the snow in my yard because I am so sick of seeing it! This would be a cute idea to do with my daughter when she is older, too. What a fun idea! I've never even thought of this before. Love this! And the picture with your cat is too funny! Ha, love that cat one the best. Ha- that's awesome! I laughed out loud at that cat picture!! Hahahah! I'm dying! This is so awesome! Thanks so much for posting - this may actually make me want one more snow! Ha! So fun! I remember painting in the snow with food coloring. I wish I had thought of that when we had our blizzard last week. We're experiencing 60 degree weather this week, so I don't think I'll have an opportunity to do that for a long while. This is too awesome!! I want to go write "no more snow" right now! Enough! My brothers and I did this once as kids - we made a ninja turtle and a lion (I was reading the Chronicles of Narnia, again). My mom made us a whole set of colors and it kept us busy for a few hours! You know, usually I can't get enough of winter. I welcome its chilly factor, its subdued palette, its icy temps and need for countless layers, but this time around, for reasons unknown, it simply can't melt into spring quickly enough for me, so I second your plea for "no more snow" through and through (no dice there today, we woke up with a fresh dumping and more is in the forecast for the coming weekend). *PS* Thank you very much for your wonderful comment on yesterday's post. I too feel that the blogging world would benefit substantially from more quality over sheer content volume. Ugh the snow! I agree 100%. No more snow! lol, that actually looks fun! Haha... that looked like fun! you guys have to much fun!! haha! that's awesome! Haha! No more snow pleaaaaase! I'm so over winter!! Your poor kitty looks really spooked!! There is something about a big blank white spot that screams "colour me!!!! ", and I think you did a wonderful job at it ;) Looks like fun too! We totally did this last month. My snow painting kept getting messed up though. The bottles started not spraying and stuff. I think they were freezing. How cool! I've never tried snow painting before.